You may be curious about why people are questioning vinyl windows and looking more into fiberglass windows. With the many differences, it’s important to understand the problems. Vinyl windows have always been known as the cheap solution to replacement windows, but have you considered the reason why they are so cheap? Original wood windows are often referred to the “eyes” of the structure. Many people love the look of wood windows, but they can be expensive and have many problems such as rotting and painting maintenance. 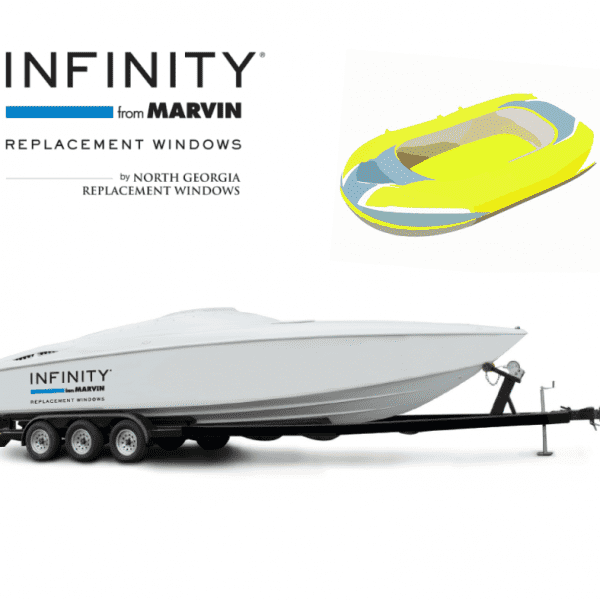 Infinity from Marvin® by North Georgia Replacement Windows has found the alternative. Infinity from Marvin fiberglass windows are made to look like traditional wood windows but without the price and the problems. The materials that make up fiberglass windows are also far more superior to vinyl windows. As talked about in our blog on “The Difference Between Vinyl and Fiberglass Windows,” vinyl is made of polyvinyl chloride (PVC). This material cannot within extreme heat, similar to what we experience in during the Georgia summers. Once too much heat hits this thermoplastic material, it can soften and distort. PVC is also where we get plastic. Windows look like the material they are made of: wood windows look like wood and plastic windows look like plastic. However, with fiberglass, you can have a window that is clean and looks like wood architecture but made of a strong durable material that will last longer than both wood and vinyl. Vinyl windows, compared to fiberglass, have thick frames because the material is not as strong. There are many downfalls to thick frames such as less light, small views, and unpleasing looks to your home. Along with these unpleasing looks, the corners of vinyl windows are fusion welded together creating unsightly corners of the windows. Fiberglass windows have clean corners with corner keys and hot melt injection. Rotting is an issue with both vinyl and wood window applications. Many times, vinyl windows are installed with capping around trim that has rotted to cover the rot and other issues. During an Infinity installation process, we replace rotted trim with a composite material that will keep your window secure and without any worries of rot. In this constant trend changing world, once you have vinyl windows installed there is no changing the color. Vinyl windows cannot be painted; however, fiberglass material can. Over time, if you want to change the color of your windows you have that option with Infinity fiberglass windows. Vinyl windows have been around for some time now, but will they last forever? Based on the amount of failed vinyl windows we have replaced, we can say they will not last. Infinity fiberglass windows are built for life®. Work with a company you can trust. Contact us to find out more about problems with vinyl windows and how Fiberglass windows can fix them.